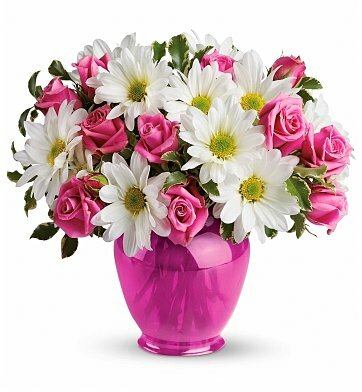 Soft around the edges and delightful to behold, bring a smile to their face with this lovely bouquet, perfect for romantic occasions, a get well gift, or just to say "thinking of you." Darling Rose Delight is a hand delivered gift. These gifts are delivered by one of our local design centers located throughout the United States and Canada. Same day delivery is available for most gifts when ordered before the cutoff time. The cutoff time for Darling Rose Delight is 12 PM in the recipient's time zone. I purchased these flowers for my daughter's Birthday Month. She loved them and everyone at work and her clients enjoy being around them. They are very Happy Flowers. She called me and told me how beautiful her flowers were. Thank you.. very pleased. I sent this flower arrangement to my Grandma and she said the delivery guy was so nice and the arrangement was just beautiful! She said it was the best arrangement she has ever received! Thanks for the exceptional service!! Will for sure order from this company again! Super quick delivery - same day order. And flower arrangement was fabulous. So pleased will use your service every time ! So pleased. Want to thank you for your kind service for my friend... she was so impressed with the little gal that offered to take her floral after closing time... but she was getting ready to leave for Vegas, she gave her the option of of getting her floral after she got back from Las Vegas!! She called and told me of the great and kind service... she said she had something to look forward to... again thank you. A satisfied customer indeed. I sent your darling rose delight to a friend recovering from major surgery. She was very complimentary on the presentation and quality of the flowers and container. It was exactly as your advertisement described. I also want to compliment your staff as they were very easy to work with and made me feel that they truly cared. Best experience I have had in a long time. My sister was Thrilled with her flowers!! What I didn't know is this is the same place her husband used for sending her flowers. ( he has since passed). I sent these flowers to my sick friend and she just could not stop raving over how beautiful and fresh these flowers were! I am very happy that they were such great quality! My mom sent me the picture as soon as she got them. She loved it and they looked great! More beautiful than the pic. We sent this to our mother for her birthday. She said it was the most beautiful arrangement she'd ever seen and u would have to agree. The flowers were fresh and gorgeous. The vase was amazing as well. Worth every penny! She said the flowers were so pretty, she loved them. Thanks so much and I'll use you again in the future. It compliments it's name by being a delight to see. Recipient was very pleased. My sick mother loved them. They brightened her room. They were fresh and beautiful.